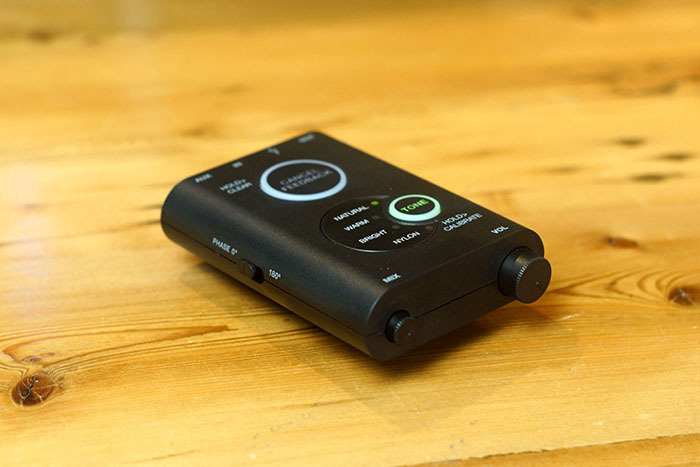 The iRig Acoustic Stage is a new device by IK Multimedia that claims to capture a higher quality sound and more accurate representation of your acoustic guitar compared to the guitar’s internal piezo pickups. It also aims to counter common issues of mic’ing an acoustic guitar like feedback and having to maintain the same position during a live performance. But, does it live up to this claim? 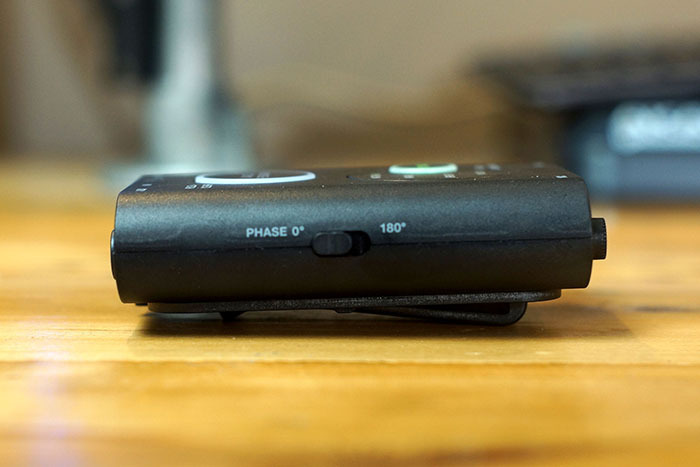 In this review, I’ll be covering the iRig Acoustic Stage in full detail. 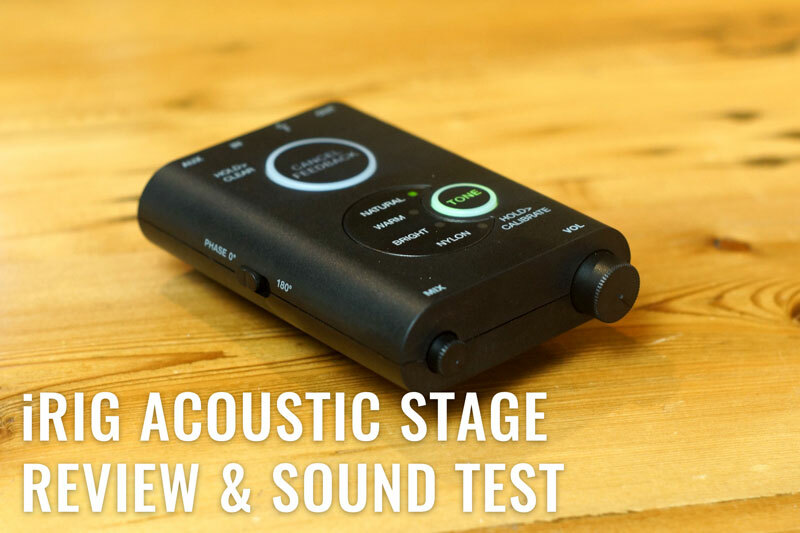 I’ll touch briefly on the features, build quality, and how to set the unit up, but most of all, I want to test the sound of the unit and see how it stacks up to the traditional methods of capturing an acoustic guitar’s sound. I’ll compare the sound from the iRig Acoustic Stage to that of my Washburn Acoustic Guitar’s internal piezo pickups, and the sound of the same guitar mic’ed up with a Rode Nt1a condenser microphone. I’ll give an A/B test of each (in the video and SoundCloud clips below) so that you get get a clear representation of the unit. 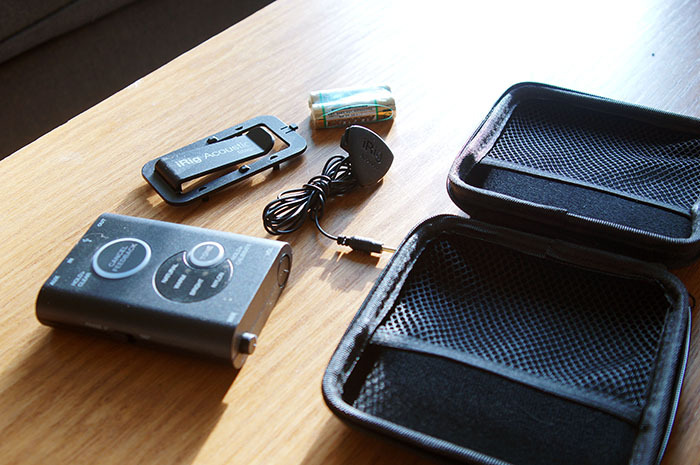 Inside is the case is the iRig Acoustic Stage itself, a clip that attaches to the receiver, the microphone, and two AA batteries (which is nice that you don’t need to worry about having or buying a set right away to use the unit). 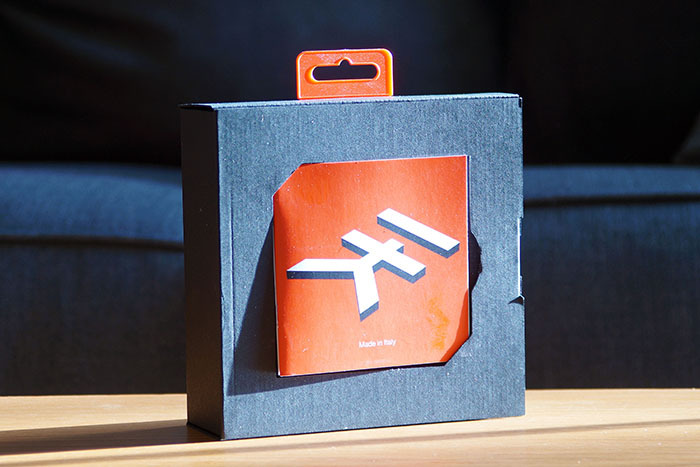 Overall, the unit is packaged very well (essentially packed inside a case, inside a box, inside another box). I definitely appreciate the included case to keep the unit stored away neatly and protected. Now, let’s move onto to the features and build quality. 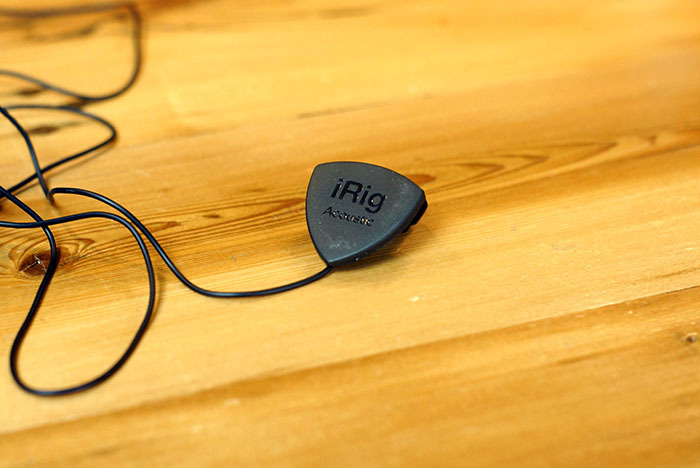 The iRig Acoustic Stage works by clipping a small, specialized microphone to the sound port of your acoustic guitar. It will also work with any other instrument that has a sound port like a classical guitar, acoustic bass, ukulele, etc. 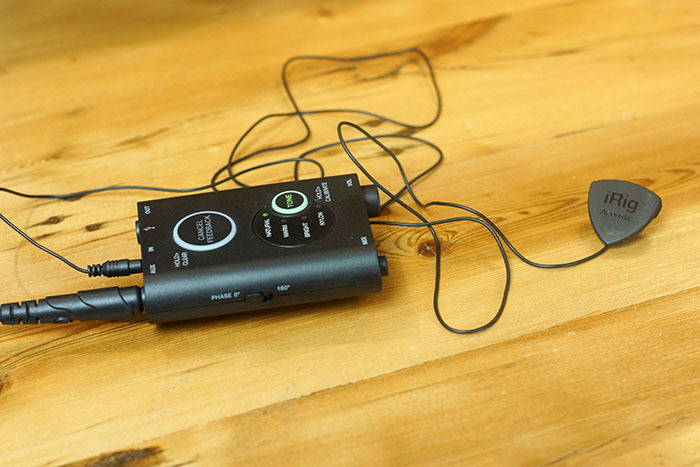 The microphone picks up the sound from the sound port and transmits it to the receiver pack. 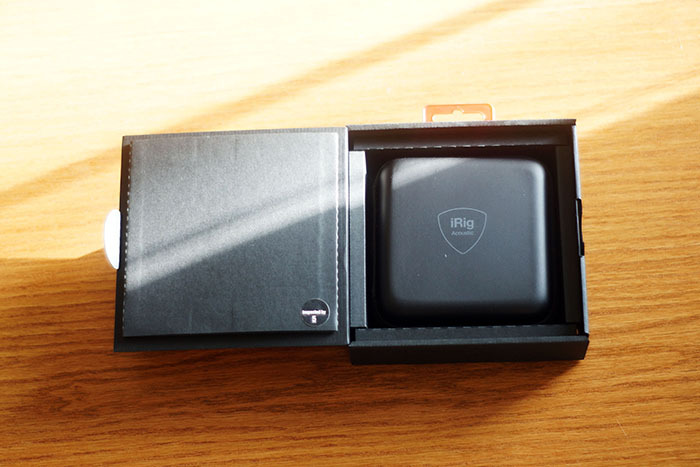 From there, the pack can be plugged into the input on an audio interface, PA mixing board, or PA speaker. 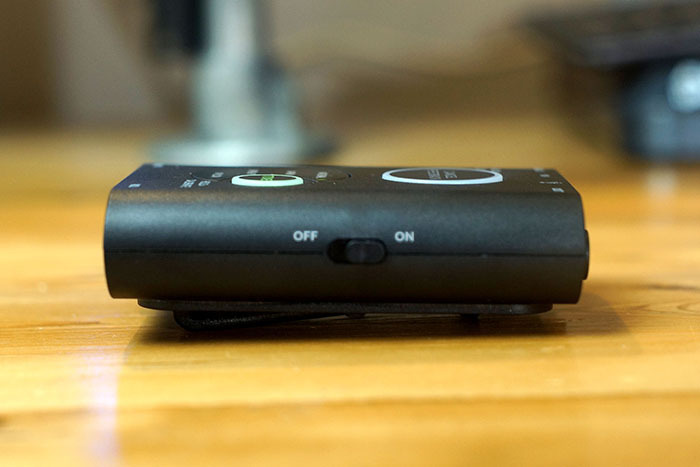 The unit is powered on by a simple “on/off” switch on the side. 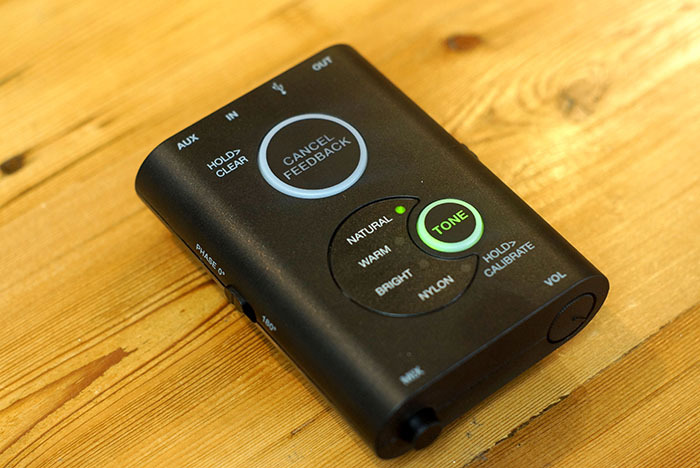 A “tone” button exists to change the guitar sound from natural, warm, and bright. It also features an option for nylon stringed guitars. 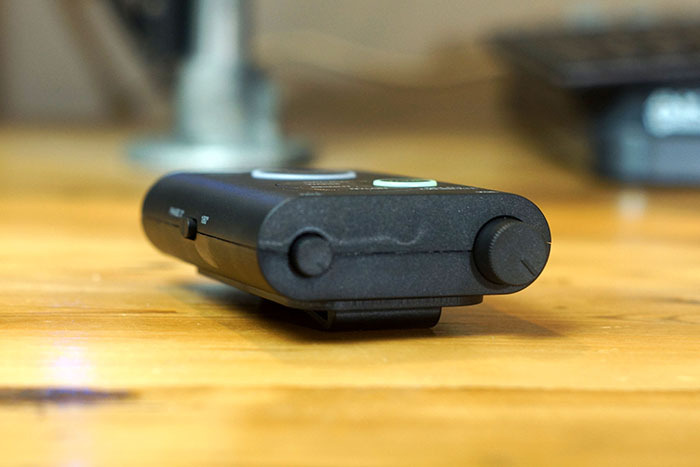 A volume knob at the bottom of the receiver pack can be “pushed in” in order to “hide” the button, and a knob labeled “MIX” next to it, can be used to mix the sound of your guitar’s internal piezo pickups and the sound from the iRig Acoustic Stage microphone (when plugged into the “AUX” input on the receiver pack). Finally, a large button labeled “CANCEL FEEDBACK” can be used to eliminate any feedback issues by simply pressing this button. 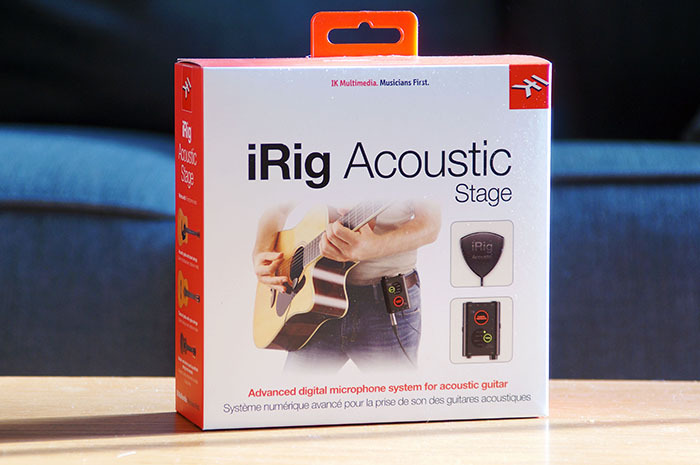 Overall, the iRig Acoustic Stage feels fairly solid and well-built. Although it is made entirely of plastic, the unit feels solid enough to withstand some abuse. 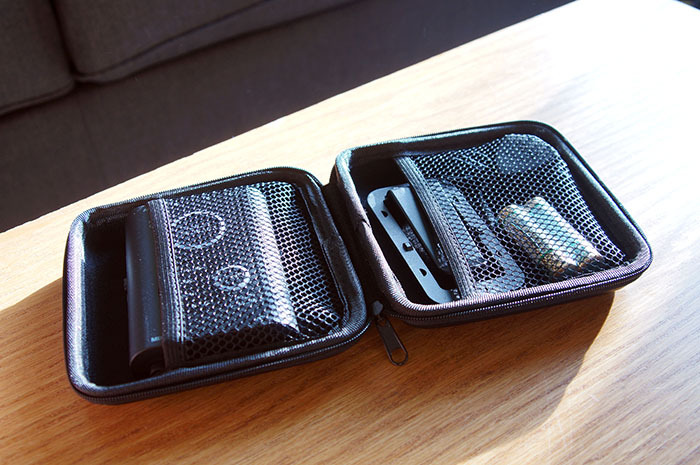 However, the included case should prevent any damage when storing in between gigs. It is very thin. About as thin or slightly thinner than that of most in-ear headphone cords. Now, this may nay be that big of an issue. But, knowing how easily headphone cords can break when wrapped up too many times doesn’t give me a good feeling with the thickness of this cable. So it would be nice if was a bit thicker. I also noticed there aren’t any replacements for this portion of the iRig Acoustic Stage specifically at this time. So if this breaks, you’ll likely have to invest in a whole new unit (unless you’re able to work something out with IK Multimedia’s support). That’s all there is to it really. Then, power on the unit, set the volume level using the volume knob, and you’re ready to go. If you want to mix in the volume of your guitar’s internal piezo pickups, you would simply plug in a 1/4″ instrument cable into the output on your guitar and the opposite end of that cable into the input labeled “AUX”. Then, you can mix in the volume of your acoustic guitar’s output with the volume of the iRig Acoustic Stage using the “MIX” knob on the bottom of the receiver pack. Should you encounter any feedback during your performance, all you have to do is hit the “CANCEL FEEDBACK” button and any feedback will automatically be eliminated. Finally, the section that you’re probably most interested in, how does iRig Acoustic Stage sound (particularly in comparison ot traditional methods of amplifying/recording your acoustic guitar)? To test this out, I decided to record my acoustic guitar with three different methods to compare the sound of the unit. 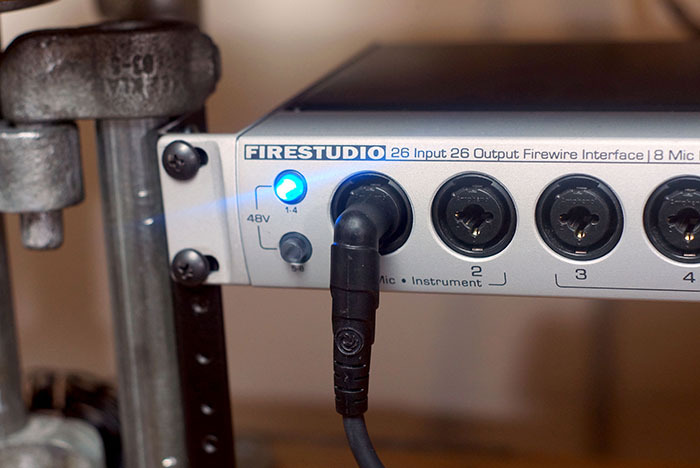 In the comparison, I hooked up the clip-on microphone on the iRig Acoustic Stage to the sound port on my Washburn 10WD SCE Acoustic Guitar and ran it into an instrument input on my Presonus Firestudio audio interface. I then plugged the guitar output on my acoustic guitar into another open input on the interface. And finally, I mic’ed the guitar up with a Rode Nt1a condenser microphone at roughly the 12th fret. I recorded each at the same time while playing a few different types of guitar melodies, trying to incorporate some picking, strumming, palm muting, tapping on the guitar face, etc. to get an overall feel for the type of sound each method produced. After hearing the results from each, you can definitely hear a distinct difference in each recording. In my opinion, the guitar output from the acoustic guitar sounds like absolute garbage. It’s way too “tingy” and there is no lower presence. There’s also a lot of rumble (especially when strumming). The Rode Nt1a sounds much more rounded but possibly a bit muffled (something that could be eq’ed out in editing). The iRig Acoustic Stage sounds brighter than the Rode Nt1a recording but lacks a bit of depth on the bottom end. However, all things considered, I do think the iRig Acoustic Stage sounds pretty good and a whole lot better than the guitar’s internal piezo pickups. To conclude, I believe the iRig Acoustic Stage does live up to its promised value of providing a much better sound than that of an acoustic guitar’s internal piezo pickups (particularly on lower to mid-range acoustic guitars like the one tested in the comparison above). The sound is much clearer, brighter, and overall just sounds much more pleasing. While it may not provide the full-range of a high-end condenser microphone (specifically that added low end), it does provide an easier and hassle-free option to playing live with an acoustic guitar. 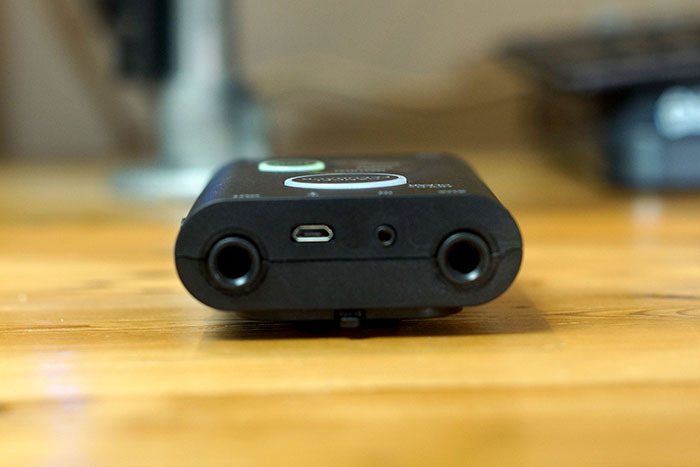 There’s no need to worry about having to sit still during an entire performance to ensure the guitar is mic’ed properly or having to worry about feedback issues (just one click of a button and it’s eliminated). So if you’re an acoustic guitarist, play a lot of acoustic sets or open mics, or just want a better way to capture your acoustic’s sound versus the internal pickups, I’d recommend picking up the iRig Acoustic Stage, especially considering it is quite affordable at only $100. If you have any questions, whether they’re on the sound of the unit or the functionality, feel free to leave them in the comments below and I’ll do my best to answer them. As always, thanks for reading! Many thanks for your review. Very complete! Is it possible to connect the iRig directly to an iPad for sound treatment on Garage Band? I’m glad you enjoyed it! According to the diagram on this page http://www.ikmultimedia.com/products/irigacousticstage/ you should be apple to hook it up to an iPad. But, I’m not entirely sure. 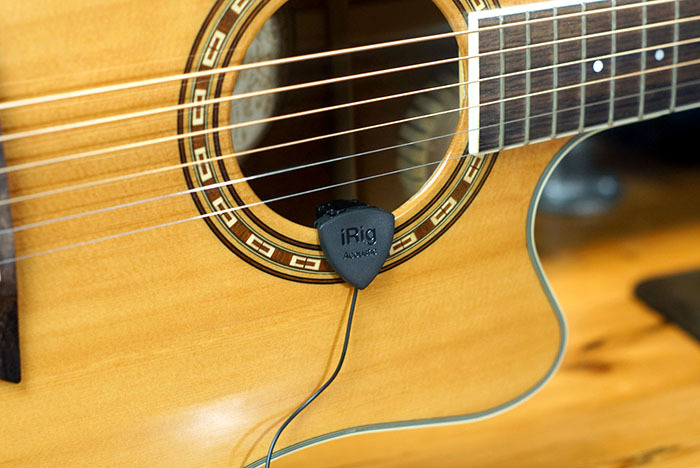 The iRig Acoustic Stage comes with a USB cable. So you can hook it up to a laptop and use it that way. You’d have to have a micro USB to lightning cable to hook it up to an iPad. I’m out of town for the week but I’ll test it when I get back and comment here again. “Compatible with iPhone 7 Plus, iPhone 7, iPhone SE, iPhone 6s Plus, iPhone 6s, iPhone 6 Plus, iPhone 6, iPhone 5s, iPhone 5c, iPhone 5, iPod touch 6th generation, iPod touch 5th generation, iPad Pro (9.7-inch), iPad Pro (12.9-inch), iPad mini 4, iPad Air 2, iPad mini 3, iPad Air, iPad mini 2, iPad 4th generation, iPad mini. iOS 6.0 or later is required. The mic cable is a failure waiting to happen. In no way or fashion will it stand up to demands of professional use. Otherwise an excellent product, The best sound I’ve come across in 30 years professional giging on classical guitar, and I’ve tried just about every system available..